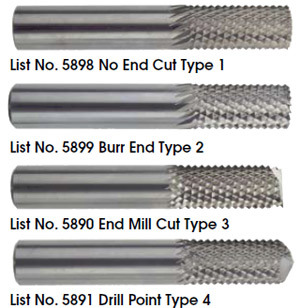 Morse manufactures a complete line of carbide burrs and routers for the professional craftsman. Because burrs are used in high spedd rotary tools to grind, etch or cut, tungsten carbide is the best material to ensure a consistent quality of cut on steel, cast iron and ferrous materials and to stand up to the high rpms and friction of cutting. A router is primarily a burr but with a longer more tapered shaft used to hollow out an area of material usually and edge or cut out of a material. Morse routers are manufactured from high speed steel or solid carbide to privide a durable cutting surface that won't wear down quickly. Steel routers work best timming and routing aluminum and non-abrasive plastics where as tungsten carbide routers work with aluminum, magnesium, plexiglass copper and more. If there is a specific Burr or Router you are looking for, please call us at 1-887-477-8665 or click here to contact us online. General PurposeRecommended for steel, cast iron, ferrous materials. Offers good stock removal and smooth workpiece finish. For rapid stock removal in tough applications. Design reduces the pulling action, reduces size of chips, ensures rapid stock removal. NF Burrs are designed for use on aluminum, non-ferrous metals, soft steel, reinforced plastics, and other soft materials. High flute design for easy chip flow and fast stock removal. Provides excellent work finish with minimumloading when cutting soft, sticky metals. Features 2 downcut flutes with drill point for trimming, routing and other operations in aluminum,non-abrasive plastics and other materials. For use in a wide variety of materials including aluminum, magnesium, plexiglass, plastic, copper,hardwood, formica and hard rubber. 30 Degree left hand helix, right hand cut. For use in graphite composite laminates, polyester glass reinforced products, phenolic epoxy parts. 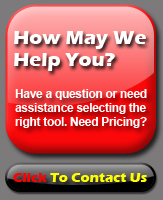 Didn't find the Morse Burr or Router you were looking for or need assistance in selecting a Burr or Router?